Brad serves as Broker and Vice-President of Greater Potomac Realty. He leads the company’s sales and leasing department. He has extensive experience in commercial real estate while being licensed for over 17 years. Brad is a member of the National Association of Realtors and Greater Capital Area Association of Realtors. 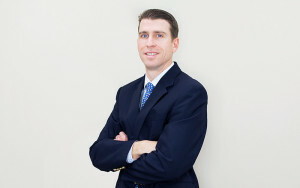 Brad joined Greater Potomac Realty shortly after graduating from Villanova University in 2001. In 2010, he received his MBA from the Robert H. Smith School of Business at the University of Maryland.